It’s always a pleasure to be invited to the seaside! My trip to Brighton this summer, however, wasn’t to build sandcastles (another time perhaps…. ), but to see the work of our lovely Brighton teacher, Belinda McBride. 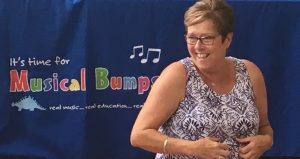 Belinda has owned the Brighton branch of Musical Bumps for a good few years now and she is well loved by all her students and families, so you won’t be surprised to hear I had a wonderful day! I arrived at the Hanover Centre on a bright and sunny morning – and found myself in a super hall full of happy kids and lots of smiling faces. Belinda is very welcoming to everyone of course – and everyone was pleased to see her too. One of the things I love about Belinda’s teaching, is that she is prepared to stop and explain things – things that are obvious once she does, but that might not have occurred to us otherwise. 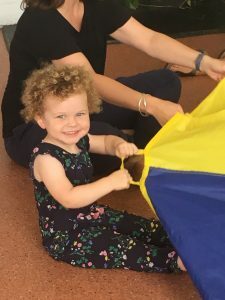 For example, playing the castanets might be tricky, but she noticed how the little ones were really trying to get it right – practice makes perfect and their fine motor skills were getting better and better. One little boy, who’d arrived a little sad and grumpy, loved playing them. So much so that he forgot about all his woes – and was quickly grinning from ear to ear. 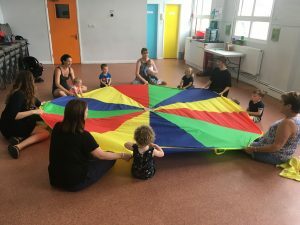 There’s no doubt that musical activities (when handled correctly) can benefit self-esteem – Belinda was full of positive reinforcement, with a super knack of catching children being amazing! 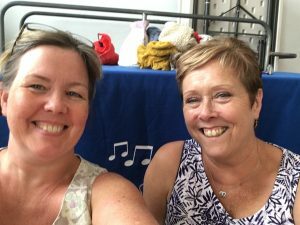 One mum who is a music teacher herself said she absolutely loves the classes – the content and how Belinda delivers classes. 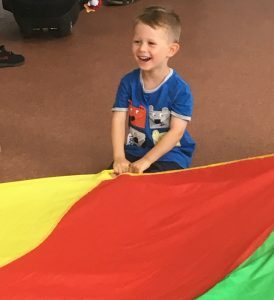 The children also clearly love Musical Bumps Brighton – they enjoyed trying all the dance moves and worked hard to get the claps in just the right place! Belinda has recently expanded her work to Lewes and brought a new teacher on board. 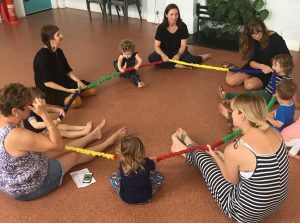 Jaimi comes along to the Brighton classes each week with her daughter – partly to keep in touch and develop her skills, partly to give her own daughter the benefit of a Musical Bumps class – you can see her sitting just to the right of Belinda in this photo. 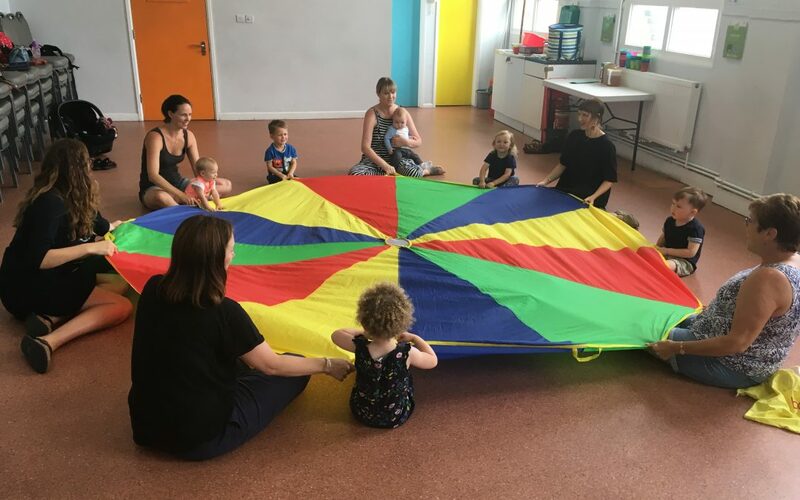 The parachute came out during the second class – this was hugely popular and very exciting – with lots of laughter and joining in. The puppets too – this week monsters – prompted creative noises and voice play. And then – my goodness, how well the children did with the tidying up (I wish her tidy up song would work on my own teenagers). Belinda’s baby class came later in the morning and was absolutely delightful. I would have loved to be part of this with my babies when they were tiny – Belinda knows everyone’s name and made every parent feel welcome. The ‘what’s in the bag’ song has quickly become a staple of all our classes and no less so in this one. There was eager anticipation as the song began and the parents really got involved. The most magical moment, however, was when the bag of more unusual percussion came out – bells, woodblock, guiro the babies were transfixed. The final class I watched on my visit was the class for preschool children. My goodness, what a talented bunch of children they were. Not only were they joining in with the songs and offering ideas, but they were quite prepared to suggest alternatives and negotiate with Belinda on just how many green bottles there were on the wall! It’s clear to me, when watching our classes for three and four year olds, that Musical Bumps offers so much more than just music. These children were not only developing and refining their musical skills, but were excellent listeners and articulate communicators. As the class I visited was an end-of-term one, each child received a certificate. I felt so proud – and they aren’t even my students! Thank you, Belinda – what a lovely trip to the seaside, when can I come back?